A former Nigerian soldier who specializes in kidnapping rich women for ransom has finally been caught by security operatives. A suspected kidnapper, Saliu Tola, has confessed before security operatives that he specialised in abducting rich ladies for ransom. Tola, a former soldier, was arrested in Asaba, Delta State by the police for alleged involvement in a series of abductions. 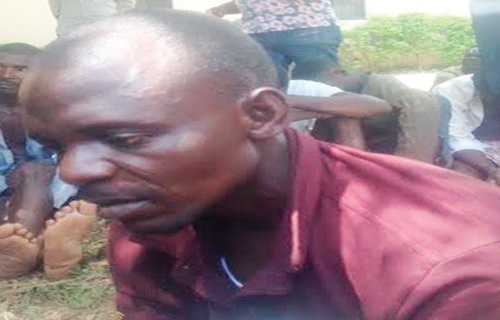 The 53-year-old suspect was one of the more than 173 others arrested for armed robbery, kidnapping and cultism. They were said to have been terrorising towns and villages in the state. Tola, who hails from Adamawa State, said he voluntarily resigned from the Nigerian Army to raise a four-man gang of kidnappers. Although he refused to name his victims, the suspect said he had participated in the kidnapping of three female victims and realised huge sums of money from the abductions. Tola, however, said his gang had not killed any of its victims. He said: “We did not kill any victim and no victim had died in our hands. We make money from the game (abduction) and set them free thereafter.” Nemesis caught up with Tola after he arranged with the family of a female victim to collect N1 million ransom at the popular Gabbs Supermarket on Okpanam Road in Asaba, when detectives swooped on him. The state Commissioner of Police, Zanna Ibrahim, supported by his Public Relations Officer (PPRO), DSP Andrew Aniamaka, and the team of detectives, said the suspect had been a notorious kidnapper because of his military experience. The commissioner said he was on the verge of beating the intelligence of his men on the day he was arrested “but his tactical withdrawal failed him and here we are today”. Ibrahim said the suspect and his gang members, now at large, usually trail their victims to places of interest, including eateries, supermarkets, relaxation centres and schools, pounced on them and ferry them away in their waiting car. The police chief said Tola and other suspects would soon be arraigned at the completion of investigations.